CHARMING 2/2 AMELIA COURTYARD Villa in the Village of Sabal Chase. LOW MAINTENANCE landscape w/a limited amount of grass in back. Enter through your leaded glass door to the entry w/TILE ON THE DIAGONAL. Notice the CROWN MOLDING & PLANTATION SHUTTERS. Your UPGRADED âblack & whiteâ kitchen features TILE floor, GRANITE counters, lots of bisque cabinets, STAINLESS appliances, GAS range, SIDE-BY-SIDE refrigerator, breakfast bar at the âpass throughâ, desk space & closet pantry. The guest bedroom has carpet, closet w/built-ins & en suite bathroom w/GRANITE counter & tub/shower. Your Master bedroom w/carpet features a SLIDING GLASS DOOR to the lanai, walk-in closet & en suite master bathroom w/TILE floor, GRANITE counter, walk-in shower w/frameless door, dual sinks & linen closet. Enjoy your OPEN & SPACIOUS dining/living area w/lovely LAMINATE flooring, sliders from the dining room to the side patio & sliders from the living room to the SCREENED lanai w/CHATTAHOOCHIE RIVER ROCK flooring. You can enjoy the LOVELY backyard patio w/brick pavers, landscape lights, TALL COURTYARD WALLS for extra privacy, palms & shrubs. 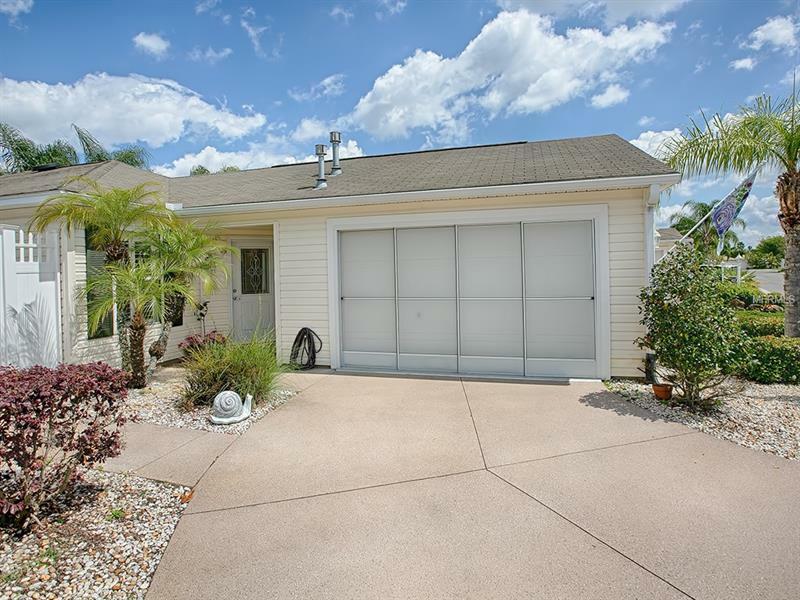 The garage has space for a car & a golf cart, extra cabinets, set tub & ceiling fan. Other features: New HVAC system-2017, WHOLE HOUSE WATER SOFTENER/FILTRATION SYSTEM, SOLAR TUBES in kitchen & master bathroom, and MORE! HURRY TO SEE THIS VILLA - IT WONâT LAST LONG! Handy to shopping, Lake Sumter Landing town square, and all the amenities of The Villages. Security system does not convey.